The Hunter Douglas Architectural range of stretch metal ceiling systems provide architects and designers with the opportunity to design an optical contrast between the ceiling and it’s surrounding materials. 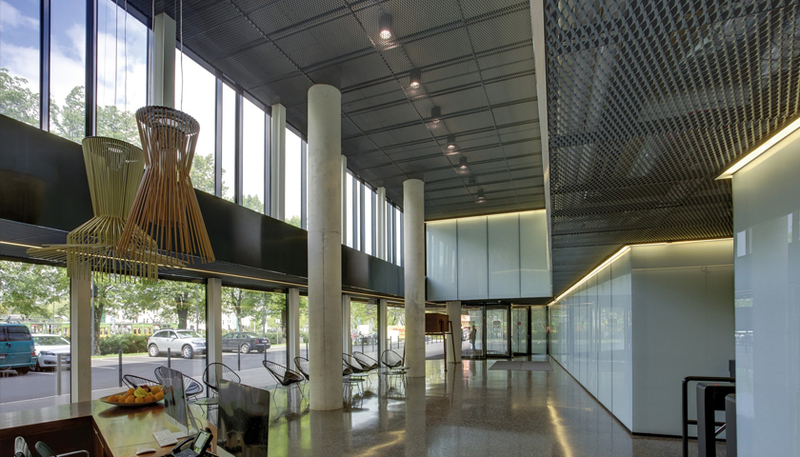 Manufactured from sheet aluminium or steel, stretch ceilings are produced by punching slits into the metal whilst simultaneously stretching the material apart. A myriad of shapes, sizes, patterns and openings can all be achieved by utilising Hunter Douglas Architectural’s extensive tooling range. Ideal for corridors or individual patterned ceiling areas, panels can incorporate lay on pads for extra acoustic control and feature square edge design in parallel or cross design installation. Panels are extremely light weight are simple to install and offer quick and easy access to the plenum. The Hunter Douglas Architectural range of stretch metal ceilings is available in any RAL colour. In addition there are several specific metallic colours and chrome finishes possible. If required panels, grids, bandraster profiles and edge profiles can be finished in one colour for a complete uniform finish to the ceiling system. For more information on Hunter Douglas’ stretch metal ceiling systems, please visit their website.